"Come for a day of shopping with many great vendors and handmade artist. This is a fundraiser to raise money for Peggy Patison who has stage 4 brain cancer. We need your support some come on out and purchase some great products." "Jump-start the holiday season with a delightful day of unique shopping, crafts, gifts, food and entertainment! Conveniently located on the northwest corner of the Dallas North Tollway and Royal Lane, browse an array of shopportunities from artists, crafters and designers and enjoy lunch in the Happy Holidays Cafe." Booth fees and sizes vary, prices range from $25 to $125. Please see application for a detailed pricing explanation. Fees include 1 chair. Extras (tables, chairs, electricity) can be purchased. For more information, visit their website or contact their event coordinator at Chair@StartTheSeason.com / VendorCoordinator@StartTheSeason.com. Help spread the word, tell them DFW Craft Shows sent ya! Looking for your own Event Listing? You can submit show information online here. DFW Craft Shows is a free service provided to help unite our arts & crafts community. Due to the sheer number of event submissions, DFW Craft Shows is unable to verify all event information and encourages vendors to confirm information for their potential shows. Applications are available here and are due by June 30, 2014. For more information, view their guidelines or contact their event coordinator, Denise, at scenter@cityofallen.org / 214-509-4823. "The Grand Prairie Community Health Fair purpose is to promote the health and well-being of the residents of Grand Prairie by increasing visibility of health and wellness resources within the community, increasing personal health awareness, providing a variety of health screenings and education in effort to motivate participants to make positive health behavior changes. Health care and wellness providers in our community that will be participating: Parkland Health & Hospital System, Methodist Men’s Prostate Screening Program, South Texas Dental, Wal-Mart Vision Center of Grand Prairie and the Grand Prairie Police and Fire Departments to name a few. We will also have many health vendors with products available to improve your well-being." This fee includes water and snacks through the event. Applications are available here and are due by May 30, 2014. For more information, contact their event coordinator at Tiffany@abundantlifegp.com. "Come and SHOP at the 16th Annual Birdville High School PTSA Craft Fair! $1 Donation at the door goes to Project Celebration. We'll have Handmade Booths alongside your favorite Brand Names, Baked Goods, and Entertainment! We'll have a wonderful variety and well worth the $1 at the door!" Booths are 10 X 8 and cost $70. No extra charge for electricity, but the applications needing electricity are first come, first serve. 2 chairs per booth will be provided. Volunteers will be available to help unload and load. Free coffee and donut! Applications are available here and are due by September 20, 2014. For more information, visit their website or contact their event coordinator at birdvillehighptsa@gmail.com birdvilleptsa@gmail.com. Applications are available here and are due by June 20th, 2014. "It's the 2nd Annual Spring Festival! We are looking forward to another successful year. We will feature popular items as custom jewelry, home décor, candles, and handmade items. As well as live entrainment for the whole family! We are thrilled to directly support San Francisco de Asis Church. We greatly appreciate your support and look forward to seeing you soon!" Cross-Section: LBJ/635 and Ferguson Road in Dallas. "A truly unique shopping experience. Hand made, repurposed, and art of all mediums. 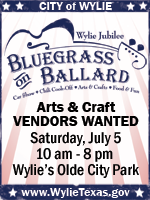 Indoor spaces and a shaded garden area that features singer/songwriters as well as additional vendors. Several artists create on the spot paintings, wood turnings and more. This market features a special "Sneak Peek" night on Friday evening with music and refreshments. Also check out their 'Paint & Sip Parties' on 1st and 3rd Saturdays." "Come for HAPPY HOUR! Food & Drinks! SHOP Local Vendors! Unique handmade items! WIN Fantastic Door Prizes! Raffles at every booth TOO! Face-painting for the kids! Meet & Greet Local Small BUSINESS OWNERS! Networking at its finest! Looking to start a new business and need more info? Come get information on Direct Sales Businesses! A great way to support community & Small Business AND have a blast doing it! Kids can play while parents shop! Special Meal & Play packages for ALL who attend--Game card, 1 hour Bowling plus Shoes, large drink and meal deal! BUSINESSES - come see the meeting rooms available for your team meetings or parties, Enjoy Laser Tag, Mountain Climbing, Game challenges and more as part of the Team building services Alley Cats provides!" Booths are 10 X 10 (outside) and cost $25. Canopy & Weights for Canopy is required. Tables & Chairs are available for $5 each. Limited number of booths will have access to electricity which is an additional $10.00 and the vendor must supply all electrical cords. Applications are available here and are due by May 16, 2014. For more information, visit their website or contact their event coordinator at Hbaker01@nisdtx.org. "Diversity Solutions Marketing presents...a Women's Entrepreneur Resource Event! Spend the day networking with businesses resources, listen to professionals speak about social media, closing the sale, time management software, funding opportunities and more. Relax in the 'networking lounge' adjacent to the ballroom and have that one on one or break for coffee or tea. You don't want to miss out on this event!!!" Admission Fee:$10 for admission but there's a 30% discount with code "WERE." Booths are (1) 6ft table with tablecloth for $150. This fee includes two tickets to the event (which can be used as a giveaway on your social media sites), one lunch, distribution of marketing materials in perk bags (200), and indoor location where you will be able to hear the guest speaker/presenter. Applications are available here and are due by June 01, 2014. Booths are 10 X 10 and cost $100. Limited electricity available upon request. Applications are available here and are due by Aug 30th 2014. For more information, visit their website or contact their event coordinator at info@rockwallduckrace.org / phone/fax: 888-55DUCKS. Rockwall Country Fair! We can't wait to have you out for a an evening of fun and to help you get your shindig on! From music to livestock and dancing to diamond digging, you are in for a real treat: country fair style! Best part is, this event's proceeds benefit programs that help women & children!""" Booths are 10 X 10 or 15 X 15 for $50. Non-profits are free! Applications are available here and are due by June 13, 2014. For more information, visit their website or contact their event coordinator at amahargrove@gmail.com. Booths are a 5ft table and cost $35. Table not provided. Applications are available here and are due by May 12th, 2014. "A truly unique shopping experience. Hand made, repurposed, and art of all mediums. Indoor spaces and a shaded garden area that features singer/songwriters as well as additional vendors. Several artists create on the spot paintings, wood turnings and more. The second Saturday of the month March - Dec. Special events and 'Paint & Sip Parties' on other dates." All booths include electricity, tables w/ table cloths and chairs. Free parking. "Vendor & Craft Fair fundraiser for the Benbrook elementary 5th grade, to cover cost of end of year trip, gifts & promotion. Great stop for Mother's Day gifts and to support the kids. Direct Sale vendors such as Scentsy, Thirty One, Mary Kay & others. Crafters- Creations by CAB, Cross Creations & Handmade jewelry. Tamales by Hot Tamalez." Booths are the size of 2 parking spaces and cost $35. For more information, contact their event coordinators: Christy - cab987@aol.com / Autumn at autumn.westbury@yahoo.com / 817 637 7126. "Come and join us for the 6th Annual Juneteenth Jubilation in the wonderful city of Balch Springs. There will be games, food, live music, arts and crafts, and fun the entire family. Do you know a high school Junior or Senior who is needing additional money for college? Then visit our Juneteenth Website and register for our Miss Juneteenth Pageant. Come and join us for a weekend long Celebration June 19-22, 2014!" Booths are 10 X 10 and cost $25. This fee includes 1 Table and 1 Chair. For more information, visit their website or contact their event coordinator at plannerofevents30@gmail.com. "Proceeds support school functions, including the schools art program, which is solely supported by the PTA. This year, we are expecting more than 500 children and adults from throughout Southwest Dallas County. Although the carnival is a longtime Bray tradition with games, live and silent auctions, bounce houses, dunk tank, raffle, etc. and we are opening up the carnival for vendors of arts, crafts and other wares. The event is publicized through local media, the school web site, signs, fliers and word of mouth from students and parents." Applications are available here and are due by May 09, 2014. For more information, visit their website or contact their event coordinator at braypta@gmail.com / 972-293-0854, ext.5703. To apply or for more information, visit their website or contact their event coordinator at bobbi@tritradingpost.com. Booths are 8 X 8 and cost $10. For more information, visit their website or contact their event coordinator at walise@grapevinetexasusa.com.